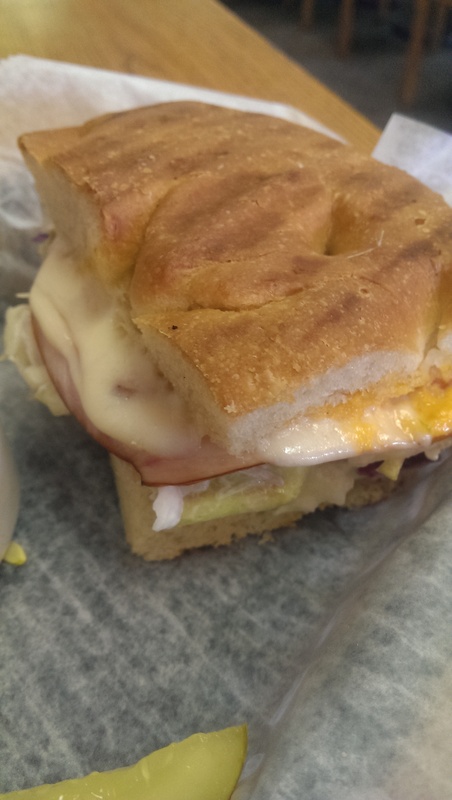 I recently learned about an amazing little sandwich shop located in Valley View just off the Tow Path at Granger Road & Canal Road. It is tucked behind the Burger King in a small strip mall between a Mr. Hero and a Schwebel Bakery Outlet. 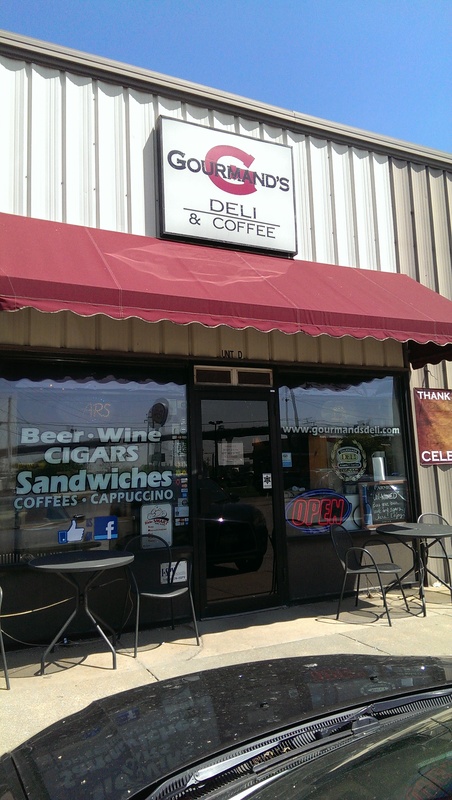 This family-run deli and coffee shop serves Rising Star coffee and unbelievably amazing sandwiches and has been doing so for the last 17 years. They use the best ingredients that money can buy, and it shows. Yelp warned that it gets crazy, so I planned to get there at around 11:15 so I could be out before the folks on lunch break arrived. They are only open Monday through Friday from 6:30 a.m. to 3 p.m., but one Yelper also warned that if you get there after 2 they may have closed early so be forewarned if you are looking to get there towards the end of their work day. I headed down I-77 the day after learning about this place that apparently served what several foodies in the know touted as “the best sandwiches in Cleveland.” I was surprised at how tiny the storefront is and was initially overwhelmed about what to do once I walked in. A very friendly and patient worker explained how things worked, and I created a graphic to help you prepare for your visit so you aren’t as clueless as I was. The sandwiches are broken down into categories and are listed on huge chalkboards to the left and behind the counter. The red chalk indicates hot sandwiches and blue indicates cold. You order under the huge “Order Food Here” sign hanging from the ceiling and then pay for your food when you leave. Beverages are available in coolers or at the soda fountain station on the back wall. 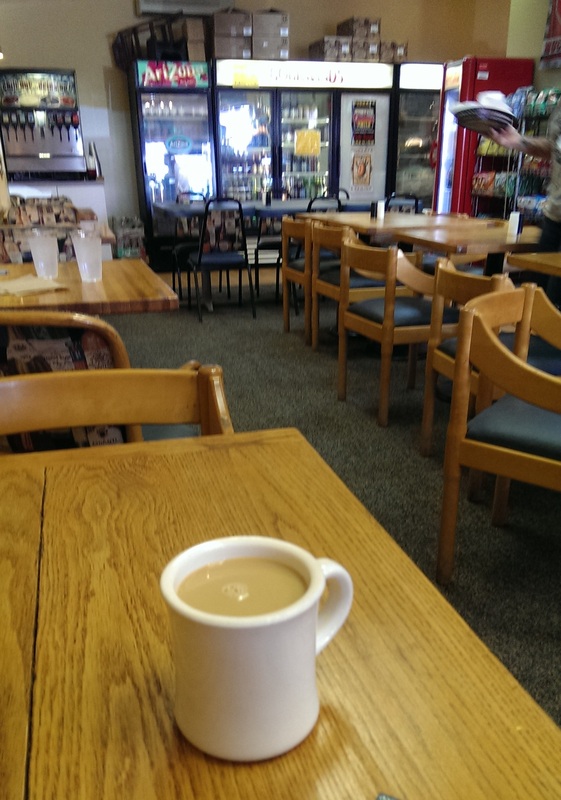 Once I finished ordering, the friendly guy behind the counter fetched my cup of coffee, leaving me room for cream, and pointed me in the direction of the coffee bar where I could find half and half on ice, sugar and/or sweetener, silverware and napkins. I then sat until my name was called out. I ordered the Hawaii Five-Oh, which features smoked turkey, pepper jack cheese, pineapple chutney, bacon, coleslaw and Maui sweet onion potato chips on toasted sourdough. It was warmed in a panini press and all I can say is WOW! This sandwich was DELICIOUS. The flavors blended together perfectly. The smokiness of the turkey, the sweetness of the chutney, the creamy freshness of the coleslaw and the crunch of the potato chips just worked together so well! Each bite was an absolute delight. I have a new favorite sandwich. I ordered it with a cup of soup, which was served in a mug. 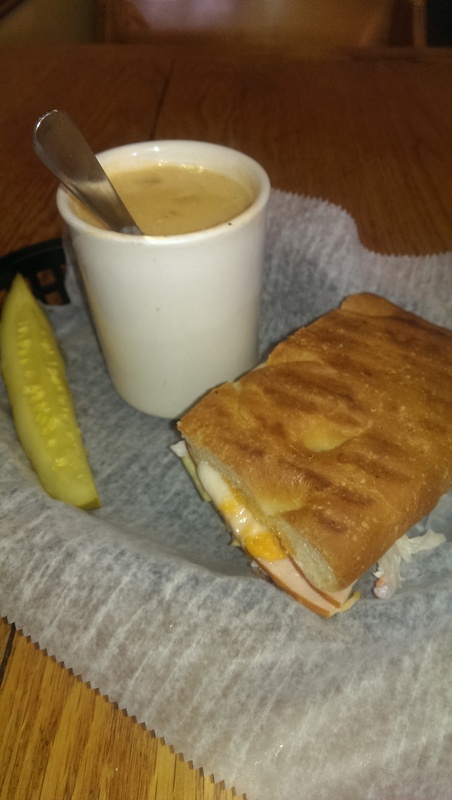 They have two or three homemade soups every day. I chose the the Baked Potato. It was decent, but didn’t knock my socks off. It featured chunks of potato that I could tell were hand peeled. It just kind of paled compared with flavorfulness of the sandwich. I guess in a way it was a decent balance for it though. Being a big fan of hoagies from my school days (when done well a hoagie can be pure delight), I ordered The U-Boat, which features Bavarian ham, smoked turkey, Genoa salami, all beef b ologna, Monterey jack cheese, lettuce, tomato, pepper rings and Italian dressing on a hoagie roll, to eat later that night. The hoagie did not disappoint. The bread was soft, the meat was fresh and the Italian dressing dripped from the sandwich, which I always view as a sign of a good sub. I hate subs where you can barely taste the dressing. I ordered it with a side of “potato chippers” – homemade kettle chips that are seasoned and served with a Ranch dipping sauce. The Ranch dressing was necessary, because the pepper seasoning was intense but good. The friendly worker also pointed out that they make “Pick 6 Salads” where you can choose any 6 toppings to serve with the lettuce and dressing. There are two sizes as well as three types of lettuce, 13 dressings, four cheeses, and lots of veggies, fruits and nuts to choose from. You can add chicken for $2.25, tuna steak for $7.95, tuna or chicken salad for $2.75 and avocado or hummus for $0.95. Fair trade coffee beans, beer, wine and cigars are available for take out. Update: I just made my second trip. I ordered a cup of soup and a 1/2 sandwich. 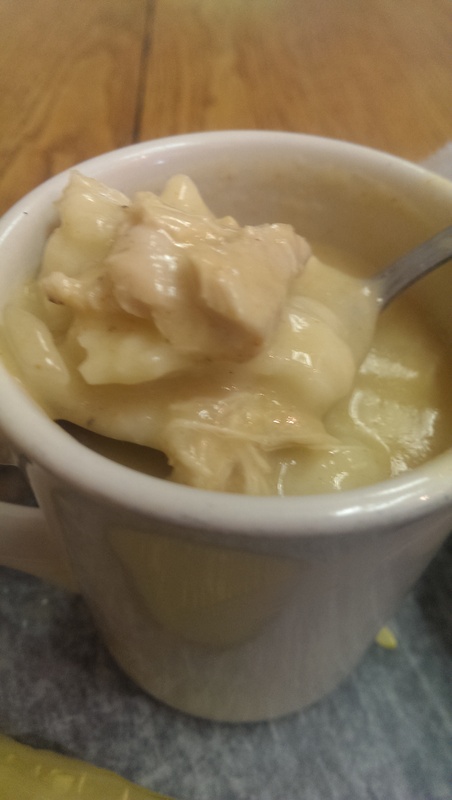 I chose the chicken paprikash soup and the Mandalicious. Wow, the soup was absolutely phenomenal. I really had to talk myself out of ordering a bowl to go. I didn’t want to be greedy though, and left some for the lunch rush. The Mandalicious was also delicious. Named for Amanda from Lilly Chocolates (she apparently used to work there and it’s already known that she has some serious good taste! 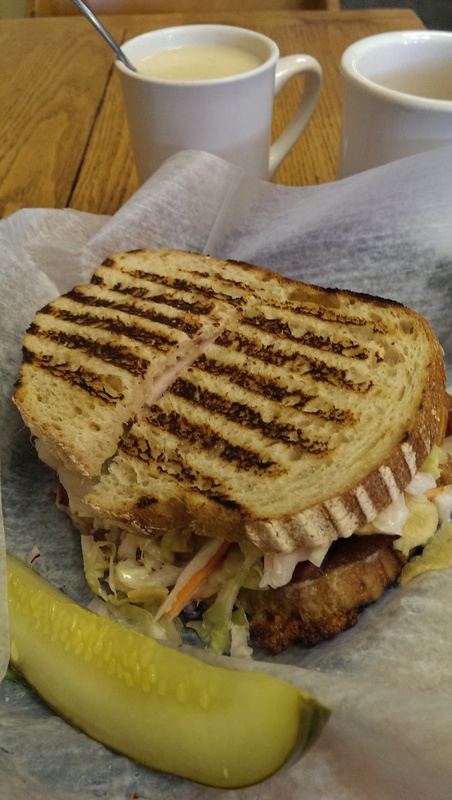 ), it features smoked turkey, bleu cheese dressing, Thousand Island, provolone & coleslaw served hot on toasted foccacia bread. 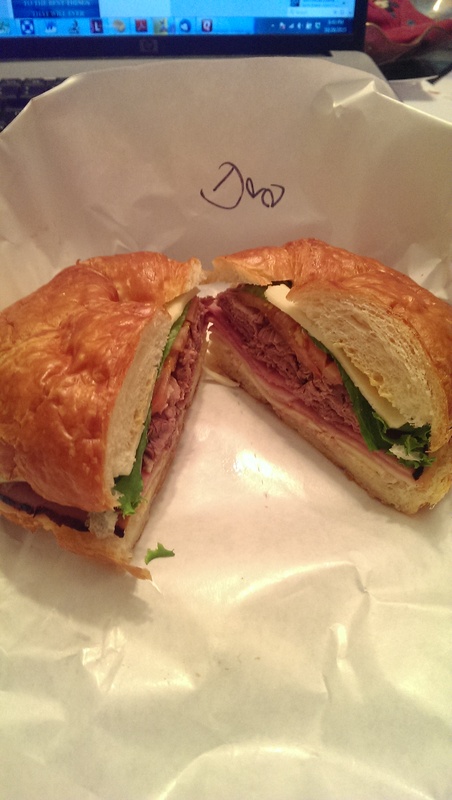 Yet another seriously awesome sandwich experience. I also ordered a side of the potato salad, but wasn’t as impressed with it. I tend not to like mayo/mustard-based potato salads, having grown up eating my mother’s potato salad made with half mayo, half sour cream or Fragapane Bakery’s potato salad. But don’t get me wrong, it was a decent potato salad and would be a good accompaniment to any sandwich there if you like mustard-based potato salads. My boyfriend swears by this place, but I haven’t made it there yet because of the limited hours. You aren’t the only one. I told one of the foodies I know that I would drop a sandwich off for him at the Cleveland Clinic on my way home the next time I head there. If you find yourself with a weekday off try to check it out. They are closed on Memorial Day this week though.